WARSAW, Poland, March 26, 2019 /PRNewswire/ -- 450 startups and 100 scaleups, 450 representatives of companies and corporations, 300 investors. In total, more than 2,000 participants met on 19-20 March at the Palace of Culture and Science in Warsaw at Wolves Summit, an international conference dedicated to innovation in technology, to jointly support the creation of valuable business relationships. Experts talked about technological and business trends as well as innovation forecasts for the coming years. 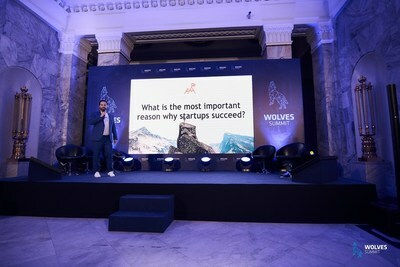 The ninth edition of the international conference for startups, investors, investment funds and corporations, Wolves Summit, has ended. The Palace of Culture and Science in Warsaw for two days was filled with valuable talks about business, innovation and investing in groundbreaking technologies that solve the problems of the present and could make our future easier. Participants had an opportunity to listen to the leaders of the business world of innovation in technology, including Alex Kartsel - Country Manager of Bolt (Taxify) and Michał Wronczyński, CEO of Samurai Labs. Wolves Summit focused on valuable and proper networking, especially the 15-minutes meetings, which once again proved to be the most important element of the event. Almost all conference participants took part in them - so-called matchmaking during the event enjoyed the high interest (over 4,500 meetings were set up). This allowed representatives of the technological environment to get to know each other better and establish valuable business partnerships, start investment negotiations, or collect feedback on their solutions. "Warsaw is a city open to everyone - this message is one of the foundations of our ecosystem of startups and innovations. The Wolves Summit conference, the largest international meeting of innovative entrepreneurship in this part of Europe, is an opportunity to exchange knowledge, experience and inspiration, find partners in business and build a climate for generating innovation," said Michał Olszewski, Deputy Mayor of the Capital City of Warsaw..
During the March edition of the Wolves Summit the topics touching the impact of technology on the environment and society were not forgotten. Speakers talked, among others about Smart Cities and transformation to a low-carbon economy. It has been acknowledged that the hope of the Earth lies in innovative technologies that aim to protect the Earth. Startups could once again participate in the conference for free and in appropriate conditions talk with investors and representatives of corporations who were looking for innovative solutions from various industries. "We attract capital to Poland, help startups grow and spread a positive impact not only on Poland but on the entire planet. We support entrepreneurship. We are glad that the awareness of the benefits of building bridges and cooperation as well as the effective merging of businesses is constantly growing," comments Piotr Piasek, Founder of Wolves Summit.